The plug-in application CAD Studio Inventor Tools (X-Tools) makes the most popular iProperty tools available in Autodesk Inventor 2013/2014, 2015/2016/2017 and 2018/2019/2020, and first of all it extends this functionality. It adds a series of automatically updated properties (iProperty fields) into the document (drawing) environment. It also adds other useful functions to make designing in Inventor more effective. It is also available in a free version X-Tools LT. There are two methods for filling in the values. The first one are custom properties similar to the iProperty tool. Only the existing properties are filled by default. If you want to force creating these properties, check the option "Create property if needed" in the Settings dialog (it will be created automatically on the first save of the document). The second method is a text field with a title block prompt. For this method you need to set the input prompt in the Settings dialog. If the title block prompt and the settings prompt do not match, the particular property will not be filled in. This input method can handle some properties which differ on the individual sheets (Sheet format, base scale, etc.). "X-Tools" is an add-on .NET application (plug-in) for the 32-bit and 64-bit versions of Inventor 2013, 2014 and 2015, 2016, 2017, 2018, 2019, 2020. Its automatic installation creates ribbons to run the functions (ribbon Plug-ins > X-Tools). The X-Tools application settings dialog can be used to adjust the application options, choose the types and parameters for the automatic properties. All preset property names (see below) can be modified. On the Document tab you can set the parameters for the automatic property LastSaveDate (date/time of the last save) for the individual document types - assemblies (IAM), parts (IPT), drawings (IDW/DWG), presentations (IPN). You can specify the format for date and time (e.g. dd.MM.yyyy hh:mm). The property Mass reflects the current mass (weight) of the part or assembly from the physical properties of the model. The File Name contains the name of the current file (document). On the Drawing tab you can control the iProperty PaperSize, including some oversize formats according to ISO. The text fields of scales (FirstViewScale and OtherScales) are driven by the first view on the current sheet and (in parentheses) by other scales on the current sheet. You can control the display format of the scale list. You can also set the prefix, suffix and delimiters of the individual scales. Ont teh Sheetmetal tab you can specify the custom property of the unfolded size (if there is an unfold) SM_Extents in the document units (for the specified number of decimal places). You can also work with the sheetmetal thickness (SM_Thickness), and with the individual values of the sheetmetal size (SM_Length and SM_Width). On the File names tab you can set automatic renaming of files (members) in the frame generator assemblies. You can set prefixes and suffixes for the names, the format of automatic conter and label for the frame and skeleton assembly. The QR codes setting can specify the names of custom properties which are used to generate dynamic markers with barcodes (QR codes) for the drawings. So you can convert any property of the model (part/assembly) - or a combination of them - to a machine-readable QR code placed in the drawing (e.g. in the title block). The Inventor ribbon also contains several added tools (not in LT) to access enhanced functions of X-Tools. The Quick Accees Toolbar (QAT) offers two icons - to quickly access custom (added) properties (e.g. stock number) and to perform X-Tools settings. The function "Custom dialog" allows to create your own dialog for quick entry of the document iProperties. This dialog then displays only those properties selected for fill-in (can be different for different types of documents). The setting can be performed in the advanced configuration (see Help). The Tools ribbon contains a tab named "Helpdesk" with functions for accessing Helpdesk and posting support data to the CAD Studio's technical support. "Project origin" automatically projects origin of the part coordinate system to the current sketch. The function "As construction" converts all projected edges in the current sketch to construction. Other entities are left intact. Functions for BOM numbering - Copy positions, Synchronize positions, Update structured positions. The functiom "Copy item numbers" copies item numbers from a "parts-only" BOM to a "structured" BOM. This command sets the item numbers of all parts in the Structured BOM to the same values as the same parts have in the Parts-only BOM. The item numbers then continue so that no duplicates will be created. If the tool "Set names to frame generator files" is active, it automatically sets file names to files created by the Frame Generator. The file name format is configurable in the Advanced config. In the drawing environment you can find (Annotation ribbon) a new tab X-Tools with functions for adding texts and symbols to dimensions and for inserting QR-codes. Using the automatic validation functions you can ensure that a Inventor document cannot be saved when e.g. an assembly contains virtual components, BOM uses invalid units on merged lines, or the part number starts or ends with a space. The application settings offers a simple mode or a fully detailed option settings in the advanced mode. All the steps of the X-Tools application can be logged to a LOG file. A PDF help is available. Inventor Tools also allow to automate Inventor procedures using VBA events and iLogic extensions in application macros. You can run external iLogic rules before and after document save - these rules are executed on all documents. You can create your own menu/ribbon buttons for your iLogic rules with the XML definition file CommandsConfiguration.xml. The installation contains a set of sample rules. Publishing iMates creates copies of iMates on the assembly level (e.g. for processing male-female connectors not on the same assembly level). Find file on disk - if you select a part or assembly in the browser tree or in the model, you can find its location (file) on your disk by using the context menu - "Open location". Hide work features - this tool hides all work features in the assembly and in all dependent documents. Unlike the internal command it really sets the property Visibility to NO. Custom properties for quick access can be configured using a XML file (see the Help). Using the sample iLogic rule "Dock window" you can add any EXE application or a web page (e.g. a product catalog) as a dockable panel to your Inventor environment. 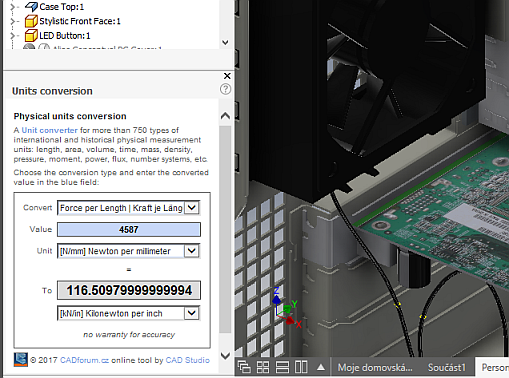 As an example - this is a docked panel with a units converter. X-Tools licensing is similar to other licensed CAD Studio add-on tools - the activation key can be purchased on CAD eShop. See also the video about using XTools for automatic parameters of a sheetmetal unfold - YouTube video on the XanaduCAD channel. X-Tools LT is a limited version of this tool set. It is available for free on Autodesk Exchange Apps. It defaults to English and supports Inventor 2013, 2014 and 2015, 2016, 2017, 2018, 2019. The version X-Tools LT contains only the functions for iProperties and QRcode, including complete settings (configuration). It can be upgraded to the full version of X-Tools. Do not install the LT version on machines with the full XTools installed (and uninstall it before installing the full version of X-Tools). For a full commercial version of XTools please go to CAD eShop - or contact CAD Studio.